Pipes on the semi-truck billow telltale smoke into the blue sky. Unscathed orange cones dot the parking lot at Douglas High School. Eight DHS seniors busily earn points toward their commercial driver’s license, thanks to a first-of-its-kind driving program at any high school in Wyoming. The new CDL course gives 18 year olds the opportunity to learn a trade virtually free. According to Douglas School District Director of Curriculum John Weigel, the class also gives seniors a focus with their final semester winding down. CDL instructor Rod Williams (right), along with Don Hathaway (not pictured), assists eight DHS seniors on getting their Class A intra-state commercial driver’s license. With a need for CDL drivers in the surrounding oil fields and other industries, Weigel and the administration made DHS the only high school in the state to offer a two-week course of this nature. The average cost of a two-week course and a CDL certificate is $4,000 per person, according to uscollegesearch.org. At DHS, the course is free for students. 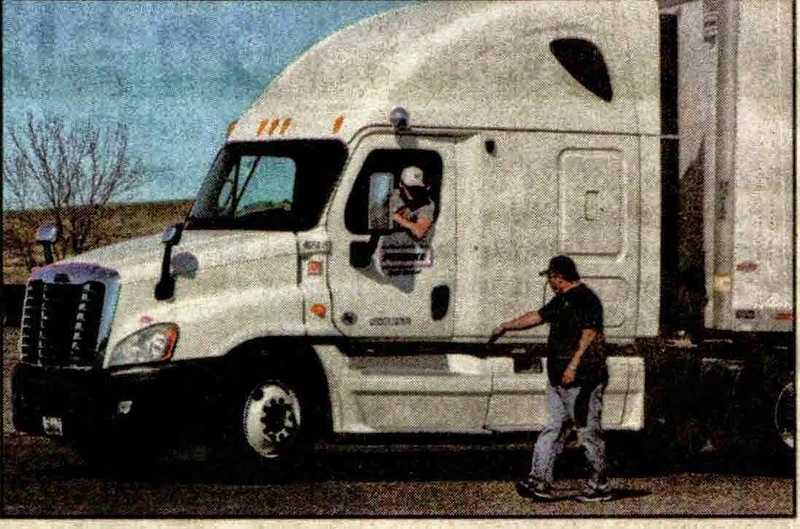 CDL College, a commercial driving and testing school out of Commerce City, Colorado, sent trucks and instructors to Douglas to train and teach the class. CDL College works with other schools and junior colleges around the region, but this is the first school district they have ever worked with in Wyoming. The class started with 12 seniors and is now down to eight, all of whom are expected to graduate from the course this week. Chris Bolinger said he plans to attend college next year but having a CDL as a backup is never a bad thing. Lane George checks and looks through his mirrors as he practices a dock backing-up drill as part of the CDL College class he participated in this month. According to DMV.org in Wyoming, a person needs a CDL to operate a vehicle that carries 16 passengers or more, hauls azardous material or weighs more than 26,001 pounds. CDL College provides the 18-wheelers and the course work, including written exams and driving assessments. The skills portion of the program consists of a pre-trip inspection, basic handling and an on-road review. Weigel said he has been impressed with the turnout and the interest in the inaugural year of the class. 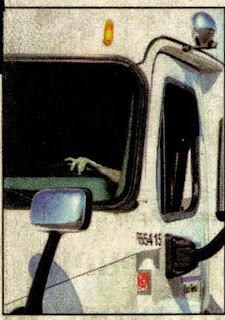 He hopes it is here for the long haul. CDL College instructor Rod Williams stands on the truck instructing one of the eight Douglas High School students who are earning their way toward a commercial driver’s license April 29. The students had to take a 40-hour over-the-road course, and this DHS group is the youngest class in 10 years on schedule to graduate from CDL College.